At 98 lbs without accessories, Wavewalk’s S4 is the world’s most lightweight skiff. In fact, it is lighter than some fishing kayaks. How does the S4’s light weight translate into advantages for its users? With its carrying capacity of over 650 lbs, the S4 boasts a weight to payload ratio of 1:6, and no other skiff comes close to delivering such performance. In other words, every pound of Polyethylene from which this skiff is made, can carry six pounds of passengers, motors, equipment and provisions. 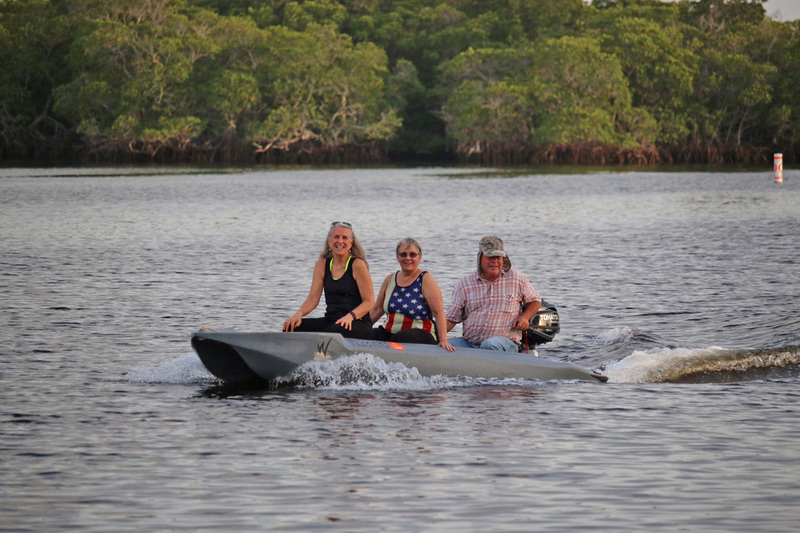 In this photo, Captain Larry Jarboe drives his S4 skiff at 10 mph with two adult passengers on board. The total payload carried here is over 550 lbs, and the position of the bow above the water shows that this S4 could have taken some extra weight on board. Both the captain and passengers are relaxed and comfortable – This is a leisure trip in the mangroves of Key Largo, Florida, an area where many motorboats go, including fast powerboats that leave big wakes behind them. The free board seen here, combined with the S4’s unrivaled stability, provide this crew adequate means to deal with this problem that everyone who goes in small boats, including Jon boats and micro skiffs is aware of, and often wary of. This micro skiff is so lightweight that one person can car top it on any vehicle by themselves, and transport the motor inside the vehicle. No other skiff or micro skiff offers such performance in transportation. Not even paddle board style skiffs designed to carry just one person on board. 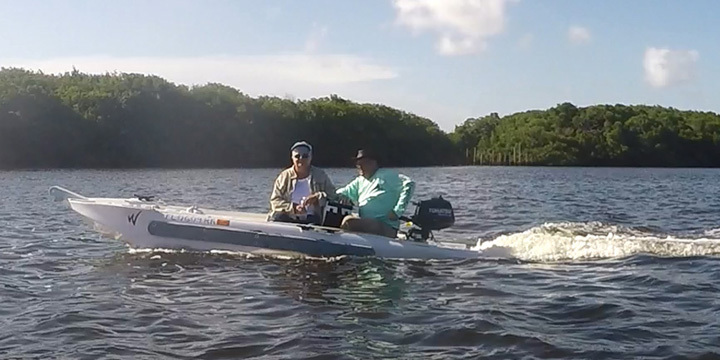 The economic advantage of being so lightweight is that the owners of the S4 skiff waste no time launching it at boat ramps, and they have more time to spend on the water, fishing, touring, and diving. In addition, they can save the money that other boat owners must spend on a trailer. One person is enough to launch and beach the S4 practically anywhere. The ability to switch to anytime to an effective paddling mode is a major advantage for anglers who fish in shallow water, grass, seaweed, and no-motor zones, namely highly productive fisheries, such as the flats, mangroves, marshes, etc. Paddling this skiff kayak is easy both seated and standing. The latter is yet another advantage since it greatly improves the ability of the angler who practices sight fishing to spot fish at a greater distance. This advantage is critical for fly fishing in these areas. Is a portable boat better, and how do micro skiffs rank in portability? A fishing trip begins at home, and it ends there. Avid anglers strive to spend as much time on the water, fishing, and as little time as possible driving to the water, launching their boat, and driving it to the spots where they like to fish. Driving to a boat ramp and waiting in line to launch your boat after you already arrived there is a frustrating experience, and so is waiting in your boat for others to take their boats out. This frustration over wasted precious time is the result of the dependence on trailers for boat transportation, and it explains some of the popularity of kayaks and car-top boats, both of which are trailer free. You want to be able to launch your boat anywhere that’s close enough to where you want to fish, and get there in as little time and effort as possible. Ironically, few microskiffs can be transported on a pickup truck bed, and fewer can be car-topped. In this sense, although the common microskiff can be trailer-free, it doesn’t necessarily rank high in portability. Wavewalk’s new Series 4 (S4) is a 13 ft long, 38″ wide, high performance micro skiff based on the company’s patented technology. One person can easily car-top the S4 on any vehicle, from sedan to SUV. Uploading the S4 on pickup truck bed is even easier. Since the S4 weighs just 98 lbs without the motor, carrying it from the car to the water and back is easy as well, and unless you need to go over pavement, you can do it without wheels or a trolley, in many cases. These facts make the S4 the world’s most portable micro skiff. Solo skiff, or skiff with room for your fishing buddy, family members, etc.? You may want to fish alone, sometimes, and you might be forced to do so in other times, if your fishing buddies are prevented from going with you. But a skiff that can carry only you on board, with no ability to take at least one additional passenger, is simply a bad idea. The S4 can take from 1 to 3 adult passengers, depending on their size, and it can accommodate in full comfort 2 large-size anglers with all their fishing gear and camping equipment. Human powered propulsion, namely paddling or poling, is a most important capability that every skiff must offer, simply because skiffs are designed to be used in shallow water, as well as in water where vegetation abounds, and these are factors that limit the use of motors. In addition, many good fisheries are legally limited to non-motorized boats. Most skiffs are too broad and heavy to offer paddling as a realistic option, which leaves their users with poling as the only human-powered option for human powered propulsion, and this is not a good thing, because poling is difficult, and a most ineffective mode of propulsion. Flats fishing can be greatly affected by tides, and being able to paddle your boat as the water gets too shallow for motorizing at low tide adds to your mobility. Therefore, you can’t “forget about paddling”, and no sensible angler would want to forget about it. Wavewalk’s S4 offers full paddling capabilities to any crew ranging from 1 to 3 paddlers, seated or standing. Its shallow draft offers unrivaled mobility in skinny water, and the ability to launch and beach anywhere, including rocky beaches, and beaches with abundant vegetation and underwater obstacles. Like Jon boats, typical skiffs feature flat-bottomed hulls, and the smaller ones offer little free board. This combination is designed to work well on flat water, but as soon as the wind picks up and waves appear, many anglers who fish out of these boats return to base, and in extreme cases they seek nearby shelter. On top of this, passengers in these small boats are exposed to big wakes that fast powerboats generate. A wake hitting a Jon boat or a micro skiff while an unprepared passenger is standing in or on it could cause that person to lose balance and fall overboard, and in case the skiff is small enough, overturn it. Jon boats and micro skiffs are sometimes required to cross bays and estuaries, and go in fast moving water, where both waves and wakes are present. Any boat that’s not stable enough, or doesn’t offer enough free board cannot travel in these waters. The S4 is true twin-hull (catamaran), and none of its buoyancy is wasted along its center line, where it would be useless in stability terms. Each of the boat’s two hulls can support the weight of a heavy guy standing in it. The driver and passenger sit and stand at a low point in the boat, with their feet below waterline. The S4 features a personal-watercraft (PWC / jet-ski) saddle seat that its passengers ride. The riding posture is the most stable of all sitting postures, and it allows the passengers to balance themselves more easily and effectively, in a way that’s fully intuitive. The same principle is applied in other high-performance vehicles such as ATVs and snowmobiles, and for riding horses.